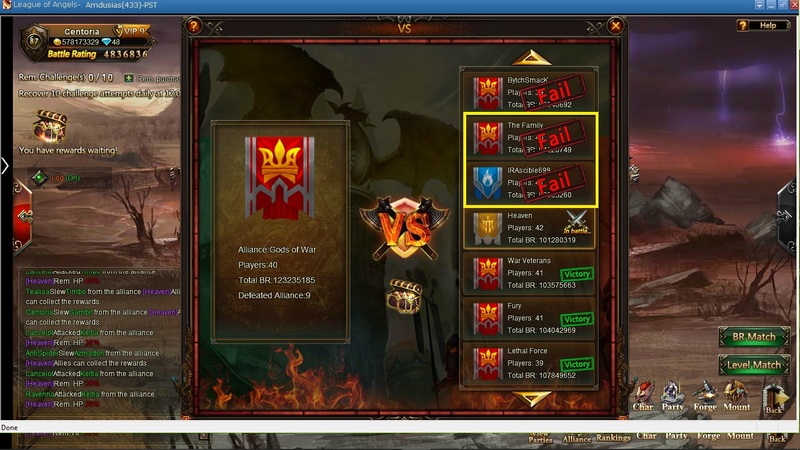 North America Forum»Forum ›League of Angels ›Support › Failed even though we won???? Failed even though we won???? hello Centoria server 433 alliance Gods of War. I was wondering why it shows us as having Failed against the 2 alliances in the yellow box even though we beat them all. The Family took us a bit due to that Orgrim having to be took down by 62% before I could kill him. Now if its going to say an alliance failed if it didn\'t 1 shot them all then that needs to change as we cant control everybody and most will want to use their attempts they are giving to help out. GT is backwards as; usual, didn\'t make any sense to do it that way. Fail actually means ye have defeated those alliances. Those marked green are the alliances that ye still need to beat and yes, ye will come up against a mirror match of your own alliance to complete the thing. It means the alliance you challenged failed to defend... and the others are still victorious as you haven\'t defeated them. thanks all least I now understand. lol very confusing for me to see failed when we won lol. 2019-4-25 04:36 GMT+8 , Processed in 0.085120 second(s), 46 queries .